Gigahertz-Optik's new BTS256-E LED-Luxmeter provides all necessary illuminance, color and spectral data to fully qualify SSL, CFL and any other type light source. 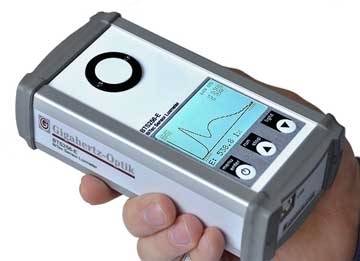 Its Bi-Technology sensor improves measurement accuracy and is precisely cosine corrected. The LED-luxmeter with integrated shutter autoranges over an eight decade dynamic measurement range. A State-of-the-Art LED Illuminance Color Spectral Meter That Accurately Measures New Technology Light Sources. An Innovative New Lightmeter Designed Specifically For Solid State Lighting (SSL), CFL, Traditional Lamps & Displays. Replaces Visual Inspection With Precise Data. It is ideal to use for Architectural, display, transportation, entertainment and any other lighting designers and engineers, field service personnel, health and safety officers. This new innovative lightmeter for Solid State Lighting is ideal for companies who need a small, compact, affordable and easy to use production based measurement device rather than a big and expensive lab level instrument. The LED-Luxmeter is built for field portability in its lightweight ruggedized aluminum housing. It is powered by a rechargeable lithium battery and features a 60x52 mm large size 240x160 pixel resolution transflective display located on the same side of the housing as the input optic. Three front panel control buttons control all meter functions.